Winter is when you want citrus – for staying healthy, and for a glimpse of bright, sunny flavors in the stark cold. The sweet and beautiful ruby red grapefruit is nearly as fragrant on the outside as it is on the inside, and it’s simply a shame to let all of those aromatic essential oils go to waste after you’ve finished consuming the fruit. If you don’t like grapefruit, that’s fine – but don’t confuse the tangy, acidic fruit inside with the sweet, almost floral notes of the zest on the outside. I happen to love grapefruit, but the Greyhound cocktail (vodka and grapefruit juice) is often too tart and harsh for my taste. So, I turned it inside out (or maybe outside-in?) and infused the vodka with ruby red grapefruit zest. This makes for a much smoother and more delicious cocktail that’s incredibly refreshing. This dog has much less of a bite. To infuse the vodka, put the desired amount in a sealable glass bottle. 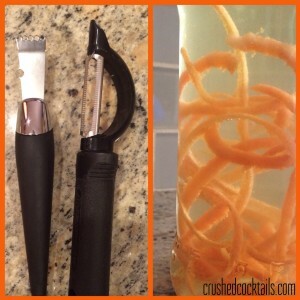 Remove thin strips of zest from the grapefruit using a peeler or zester. Be sure to only get the colored part of the skin – that’s where all the intensely-flavored oils are. The white part is bitter and has no place in making vodka taste good. Pictured below are the tools needed – either a citrus zester or a peeler – and about a 13-ounce bottle. This particular batch had a beautifully pronounced flavor that only got better with time.